This is where I keep all my charts, filed by designer, with the charts I'm gathering stuff to do in the front. I have my WIPs in a drawer together - these are the ones that I'm not currently doing anything on. 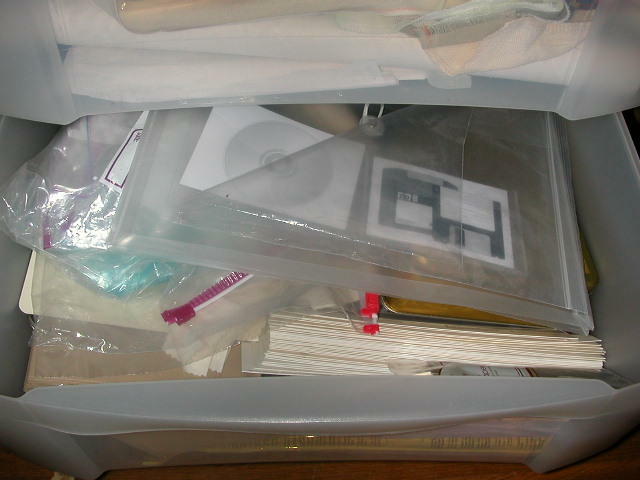 And my drawer of finished pieces that need to be taken care of (I know, I'm awful. They're just tossed in a drawer. That's on my list of things to remedy. And finally my drawer of odd fabrics like afghans, aida, etc. Now on to the flossies - I bought a wonderful old card catalog and have never finished setting it up for use. I have all my beads in the bottom, and the top is for floss. After all this sorting, I got to have some happy dances - I'm not sure if they're considered STRIP dances or not but they were projects that just needed a couple of minutes to finish off and I'd never gotten around to it. Next, a birth sampler where dad gave me the wrong date and even tho I put the name where the chart said to I didn't like the placement - the first name seemed too high. So I moved the first name down a couple of stitches and changed the date. 10 minutes. And then the birth sampler thingie that I worked on for our godchild - needed the date put on it. 2 min. And last night I put the hardware on Aer but didn't get a picture - it needs a good iron first. WHEW!! Now I **think** I can start a new project! This is just SCARY organization--makes me want to go home and start sorting DVD's. Hi Melanie, just caught up on reading since your first post. You've been up to a lot. I just wanted to say I love all the designs on your to do list and it must be hard to pick just one... at least you deserve a start from all that organisation! Don't forget to show us piccies of your progress! I love the card catalog! I look forward to reading more of your blog.